Numbered objects in Figure 1 described in the following table. 2 Message Waiting indicator Displays solid red when you have a new voice mail message. Blinks red during an incoming call. 3 IP phone screen Displays date and time, phone station name, line extensions, and softkey options (except on the Cisco SPA501G). Red (flashing): Line is on hold or there is an inbound call. Orange: Line is unregistered (cannot be used). These keys can also be programmed by your system administrator to perform differently than described here or to add functions such as speed dial, call pickup, or monitor an extension. 5 Softkey buttons Press a softkey button to perform the action shown on the label on the IP phone screen. Note: The Cisco SPA501G has the following four buttons: Redial—Dials the last number called. Cancel—Cancels an action (such as a transfer). the second party answers, press Conference again to create the conference. 6 Navigation button Press an arrow key to scroll left, right, up, or down through items shown on the IP phone screen (except on the Cisco SPA501G). NOTE SPA501 phone does not support this feature. 9 Setup button Press to access a menu to configure features and preferences (such as your directory, status, and speed dials), access your call history, set up functions (such as call forwarding), and provide phone status information. 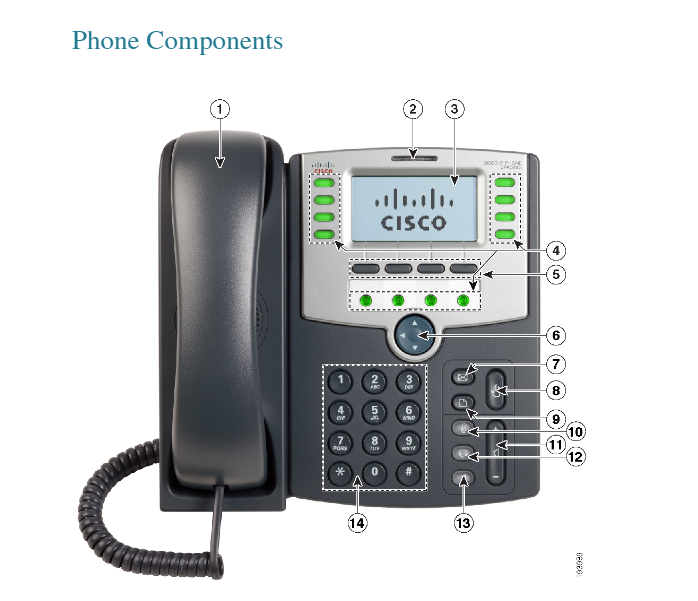 For the Cisco SPA501G, press Setup to access the Interactive Voice Response (IVR) menu that allows you to perform tasks such as getting the IP address of the phone. 10 Mute button Press to mute or unmute the phone. When phone is muted, the button is lit red. A blinking or steady red mute button indicates the network connection cannot be found. 11 Volume button Press + to increase the volume and – to lower the volume of the handset, headset, speaker when the phone is off- hook, or ringer volume when the phone is on-hook. 12 Headset button Push to turn the headset on or off. When the headset is on, the button is lit green. 13 Speaker button Push to turn the speaker on or off. When the speaker is on, the button is lit green. 14 Keypad Use to dial phone numbers, enter letters, and choose menu items.